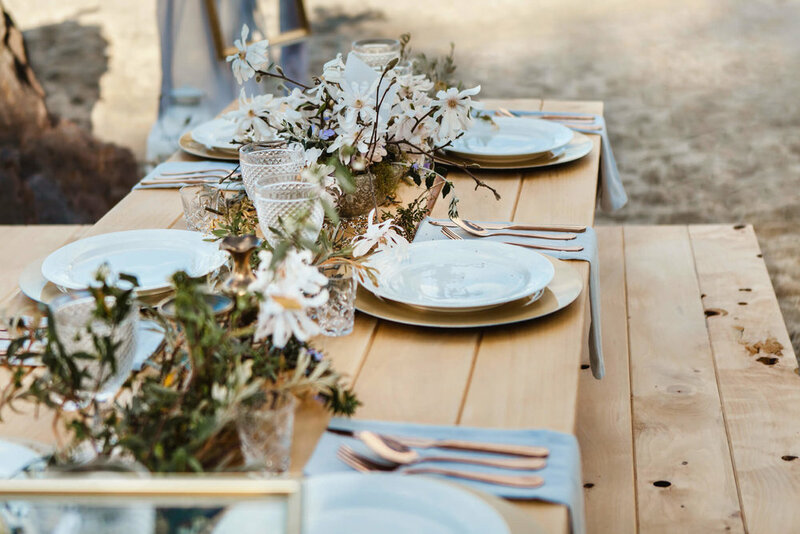 Wild&Whim is excited to have this Coastal- chic inspired Mount Maunganui styled shoot dreamed up by Wild&Whim founder Alina Johnston, featured on White Magazine Blog! We were so thrilled to be able to work with such a fantastic group of artists including photography by Amy Bailey Photography, stunningly beautiful flowers including a lush green bouquet by Rosie’s Wild Flower Co. natural wooden tables by Louisiana Lucy, sweet treats by Macarons & More, Hair & Make Up by Leanne Williams, gorgeous stationary by Inkberry Calligraphy, Decor pieces by The White Wedding Club, and the inspiration to the shoot Wedding Signage by Paper Darlings. We are so lucky to work with such gifted and multi-talented vendors. In Alina’s Words: When the idea came to mind for this styled shoot we wanted to incorporate natures beauty that the local beaches here in the Mount provide us. I was overwhelmed with the amount of support we received from various wedding vendors- wanting to join in! Amy Bailey Photography captured this shoot in all its raw beauty. The coastal moody undertones and touches of nature really allowed us to showcase what the area has to offer. The gorgeous New Zealand weather paired with modern beach stylings of Wild&Whim made for the perfect setting. We were so excited to be able to work with a fantastic group of talented artist to help bring this look together. Inkberry Calligraphy provided beautiful, deep blue and gold touches on the stationary and the perfect love quote. Her pieces tied in so nicely with the sand and greenery around. The tablescape was created by Rosie’s Flower Co and adorned with lush greenery with a multi-palette hue of blush and white toned flowers. I absolutely love the bouquet on the blue chair!! The gorgeous natural tables from Louisiana Lucy staged the perfect setting for this unique wedding table. We think this could be the perfect little spot for an elopement. We enlisted the delectable talents of Macarons & More who created the sea shell cake and some tasty macarons we got to eat at the end! The White Wedding Club added hints of bronze, gold and white décor pieces seen throughout the shoot to give it a cohesive look. The custom-made calligraphy signage was crafted by Paper Darling and reflected the natural beauty of our surroundings. Using acrylic really helped bring forth the colours from all around. Paper Darlings created the name for the piece “As Endless as the Ocean as timeless as the Tides” and it didn’t click to me that the title would eventually unfold while I was looking through all the gorgeous photos. The theme was organic, coastal, and elegant so what better way to embrace this than shooting our gorgeous model, with hair and makeup by Leanne Williams, in the lush, sandy beach of Mount Maunganui. Thank you again to all of our amazing vendors for coming out to play at the beach with us. I will treasure this shoot forever.